Obamacare’s website roll-out is reminiscent of Bob Newhart’s Infinite Number of Monkeys from decades past. In that comic scene it was hypothesized that if you had an infinite number of monkeys, each with a typewriter, eventually they would write all the world’s greatest works of literature. What they produced was an infinite amount of gibberish. One must question whether this gibberish is any different from that produced by Obama’s thousands of navigators who are needed to help America’s monkeys penetrate the government’s website. And we have yet to deal with anything of substance to improve American health care. 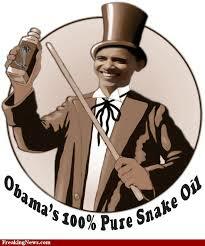 In pushing this can of worms onto the American people, Obama comes across like a snake oil salesman. In Obama’s Planet of the Apes we now find ourselves subjected to health care administered by creatures from another planet who speak our language but march to a different drummer. Rick Santelli’s video of President Obama as a snake oil salesman, and a second fact-based video from CNBC documents the nightmare experience facing America’s working folks. There is every reason to wonder if our illustrious leader even knows what is going on. Yet our chief drummer is, surprise, surprise, the President of the United States, ruler of the free and most powerful nation on the earth. He is here to rebuild America Brick by Brick. While he rebuilds the country through deception, the dumb masses support him through blind obedience. The Democratic party’s representatives in Washington have sold the country down the river through passing a law entirely on party line votes, including many votes that were bought through bribes and payoffs. Remember the senators who were holdouts and extracted millions of dollars in extortion for their supporting votes in the ACA’s final passage in the democratically controlled senate, where the most ardent apes reside. Now (11/1/2013) while Chief Obamacare Ape, Kathleen Sebelius, is testifying under oath in Washington, our America’s re-builder is continuing his snake-oil campaign in Massachusetts where Romney Care was signed into law a few years back. This parallel is, of course, no parallel, as Romney Care is voluntary, requiring no mandate. Obama Care is mandatory, requiring for the first time that all Americans purchase health insurance coverage or pay a fine. Under this system, nobody knows what provisions will be included in the government’s insurance exchanges, and nobody knows what subsidy will be paid to those eligible for a subsidy up to four times the poverty level. That is poverty times four. Fancy that!! In the Planet of the Apes, about 40% of American families of four with earnings from working will now be on the government dole, an insidious incentive of our snake oil salesman. The entire ACA system is the equivalent of the carnival shell game. Take three shells. Under one shell put “If you like your health insurance, you can keep it, – Period” Under shell two put “If you like your doctor, you can keep your doctor, – Period”. Under the third shell put “Under the insurance exchanges, you will receive better policies at a lower cost, – Period”. Move and mix the shells faster than the eye can follow, then pick up one of the three shells. Surprise!! All three shells are lies, and none are worth the paper the promises are written on. It is difficult to capture the ugly deception that has been pushed on the naive and hard working American citizens. The best visuals that capture the breadth of these deceptions may be found at Snake Oil Salesman. Don’t forget Jonestown where a cult leader killed hundreds of men, women, and children with poisoned Kool Aid, rather than to submit to government oversight. 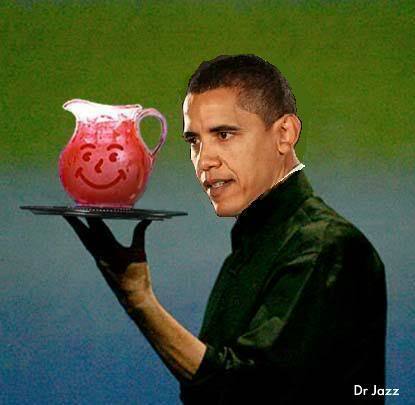 Now it is the government that is distributing the Kool Aid. Free drinks for everybody! Wake up America before we are all gone, and our country has been traded for a bag of magic beans. If not magic beans, how about Kool Aid? For many papers on Obama’s magic beans, go to Obamas Goose.